The phenomenon that is А Song of Ice and Fire has long ago transcended the domain of literature. The HBO television series is already one of the most viewed shows on television, and the most pirated one, for sure. It has literally taken the modern world by storm. The reason is simple – it’s got quality. The novels that make the series are so layered, exquisitely written and meaningful that they present an abundant source of material for debate and deliberation. Therefore it is no surprise that something like this has been published. 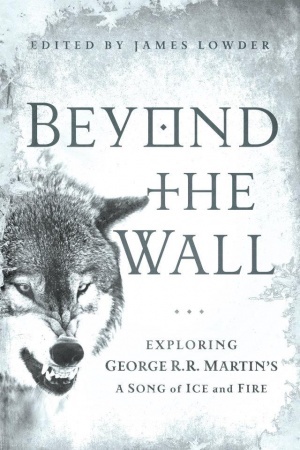 Beyond the Wall: Exploring George R. R. Martin's A Song of Ice and Fire, from A Game of Thrones to A Dance with Dragons is a collection of some 15 essays on various aspects of Martin’s exquisite literary work. And these essay do it just. The contributors are RA Salvatore (foreword), Daniel Abraham, Linda Antonsson, Myke Cole, Elio M. García, Jr., Brent Hartinger, John Jos. Miller, Alyssa Rosenberg, Jesse Scoble, Caroline Spector, Matt Staggs, Susan Vaught, Ned Vizzini, Gary Westfahl, Adam Whitehead, and Andrew Zimmerman Jones. All of the essays in the collection are remarkable. Well-written and interesting, they provide the reader with deep insight into the very world of Westeros, but also into some unexpected but important and noteworthy aspects of these books. For example, Daniel Abraham wrote about the challenges related to adapting the original books into graphic novels, and military science fiction writer Myke Cole tackled the way how Post-Traumatic Stress Disorder shaped many of the leading characters. There is also an excellent character study of Littlefinger in a Petyr Baelish and the Mask of Sanity written by Matt Staggs. One of the most interesting to me was the essay of a television writer Ned Vizzini, Beyond the Ghetto, How George RR Martin Fights the Genre Wars, about the biases against genre fiction and how that affected the critical response to the television series. All in all, this collection represents a well of knowledge and a true treat for every fan of George RR Martin’s work. It is a must read.